Over the years that I have studied T’ai Chi, I have learned three different ways of using the head and eyes from three different masters. I consider all of these ways to be of value. First let us discuss the use of the eyes. The distinction Between Soft and Hard Vision. There are two basic ways of using the eyes and processing visual sense data: Hard vision is the use of the eyes for reading and doing detailed work such as sewing, cutting, writing, removing a splinter, etc. Hard vision entails fixating one’s gaze onto a very small region and essentially disregarding the sense data that enters the eyes from the periphery. Soft vision, on the other hand, involves processing all of the sense data that enters the eyes. The difference between both of these ways is more in how visual sense data is processed rather than an action that occurs within the eyes. Using hard vision for a stationary object, such as a printed letter on a page, requires immobilizing the eyes and holding the head stationary, using the neck muscles. With soft vision, the eyes and neck are much more relaxed. Using hard vision allows one to see with great clarity but only in a narrow region. Soft vision provides optimal sensitivity to movement but does not provide much clarity or detail. Soft vision can be characterized as “seeing without looking (Read article on vision improvement). 1. Head and Navel Synchronized. Prof. Cheng Man-ch’ing (1900–1975), with whom I studied from 1970–1975, taught me that, when practicing T’ai Chi, the head always moves with the body—not on its own. That is, during transitions and final 70-30 stances, the nose and navel point in the same direction. The gaze is directed straight ahead, and the eyes “see” but don’t “look.” This way of using the eyes involves soft vision as opposed to hard vision. 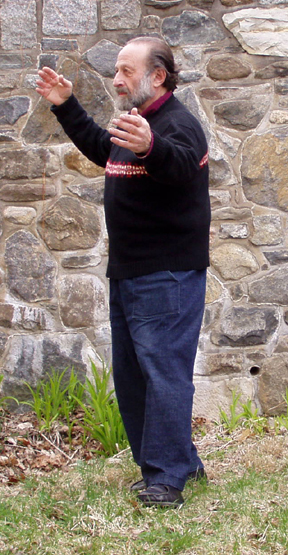 Robert Chuckrow demonstrating “Step Back to Repulse the Monkey,” with the nose and navel synchronized. It should be mentioned that, even in this method, the nose and navel do not always point in the same direction. In 70-30 stances and their transitions, they usually do. But in some 100% stances and their transitions, they do not—the nose points in the direction of the stance, and the navel points at an angle to the direction of the stance. Examples are “White Crane Spreads Wings,” “Raise Hands,” and “Separate Right (Left) Foot.” Attempting to have the nose, navel, and forward foot point in the same direction results in torqueing the knee of the 100%-weighted foot inward of its correct alignment (read article on knee alignment), which is injurious. The nose-navel method, characteristic of Prof. Cheng Man-ch’ing’s style of T’ai Chi, provides a meditative aspect to doing T’ai-Chi movement and is in accord with the principles of non-action and non-intention. 2. Floating Head. In this method, for postures that repeat, the head continually faces in the direction of the finished stance. For example, when doing repetitions of “Brush Knee” or “Parting the Wild Horse’s Mane,” the head faces the direction of the finished stance even during the transitions from the left version, to the right one, and back. The floating-head method involves soft vision (as opposed to hard vision) even though the head often faces in the same direction for a period of time. In fact, the head is not made to face that way—it does so by floating in a relaxed manner. The advantage of the floating-head way of moving is something called passive movement. Passive movement occurs when muscles in a part of the body lengthen and shorten, not by the action of those muscles but by the action of completely different muscles. For example, consider a popular exercise called spinning. One method of spinning—and there are many—involves standing with the feet parallel a bit wider than shoulder width, knees halfway bent, and turning the whole trunk alternately left and right in a state of sung. The arms, which are totally relaxed, swing from side to side, hitting the body. At the same time the head floats motionless. This version of swinging involves turning about a vertical axis. There should be absolutely no shifting and no rising and lowering. Here, the body turns under the action of the bending and straightening of the legs. As the body turns under the floating head, the neck muscles are passively elongated and shortened. Such passive movement is very beneficial for relieving muscular stress in the neck and is very stimulating to the flow of ch’i. 3. The Dragon Following the Pearl. In this method, also called “mind guiding the movement,” both the head and eyes follow the active hand. For example, in going from “Fist Under Elbow” to “Step Back to Repulse the Monkey,” the eyes follow the right hand as the fist opens and the hand circles downward, upward, and then forward to striking position in front of the right shoulder after stepping backward with the left foot. Next the eyes shift to the left hand as it does a similar motion. 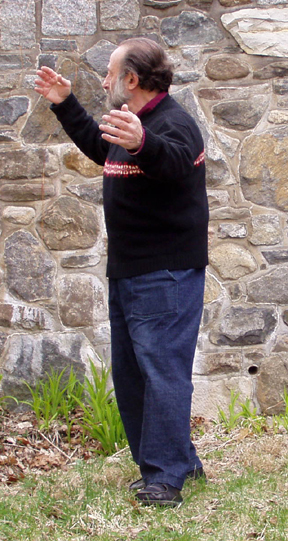 Robert Chuckrow demonstrating “Step Back to Repulse the Monkey,” with the eyes following the active hand. It should be noted that the dragon-following-the-pearl and the nose-and-navel methods momentarily coincide for some movements. One such example is during “Single Whip” when the left hand rises in front of the face, as the body shifts and begins to turn into the completed posture. Another value of the dragon-following-the-pearl method pertains to self-defense. At a certain skill level, you need not look at or even see an opponent to know where he is, what attack he intends to launch, the instant that he initiates his attack, and the part of your body he attacks. Looking at one of your own hands can be a way of inducing your opponent to also look at that hand or believe that you made a mistake, thus distracting him from observing your attack with, say, your foot or other hand. The key is not becoming captured, yourself, which would result in not successfully dealing with the opponent’s possible attack at that moment or his defense against your attack.